Don’t eat eggs or have an egg allergy? 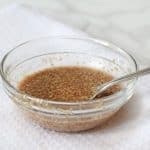 I’ll show you how to make a very simple egg substitute using ground flaxseed and water. Mix the ground flaxseed and water together in a small bowl. Refrigerate for 10-15 minutes until the mixture has thickened. Use as a replacement for one medium egg in lots of recipes such as cakes, pancakes and brownies.